Everybody is talking about kale chips right now, reaching popularity on par with potato chips. This means it’s about time to hang up your food dehydrator (advanced hipsters: hang up your solar drying racks) or switch to making chips out of something that nobody has ever heard of. 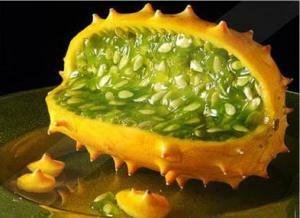 I suggest the African Horned Melon. If you do decide to try this make sure you cite the Latin name Cucumis metuliferus when responding to people asking you what bizarre dried fruit you are eating in the middle of a marketing meeting.